Yirrkala School recently celebrated the 40th anniversary of its bilingual education program. 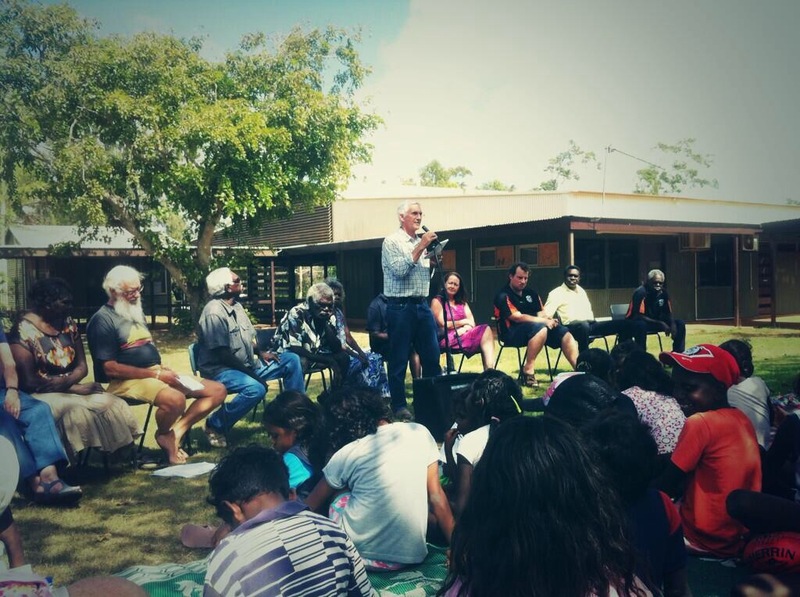 The release of the draft report of the NT government’s review of Indigenous education has generated a lot of alarm in remote Indigenous communities. Yet again Aboriginal people have been singled out for treatment that no one would even contemplate proposing for other social groups – specifically, closing remote education centres and forcing all secondary age children to go away to boarding school, which a former student of mine said reminded her of the sort of thing that went on with the Stolen Generations. Furthermore, author Bruce Wilson proposes scrapping bilingual education, thereby denying Aboriginal children the right to be educated in their first language as well as English. Did someone say “assimilation”? I’m not going to offer a comprehensive critique of the Wilson review here; I’m just one of many people working on formal responses to the review as part of the consultation process, and some very good responses have already been written by Margaret Clark and Kriol Kantri. Furthermore, I’m far from an expert on bilingual education. So I’m going to mainly confine my remarks to my own experience of working in one of the few remaining bilingual schools and what I’ve learned in the 18 months I’ve been teaching in the NT, in which time I’ve had the good fortune to learn from highly experienced educators who have devoted much of their lives to Indigenous and bilingual education. Yirrkala School has been a trailblazer for innovative approaches to education, recently celebrating 40 years of offering bilingual education to students. The school’s bilingual program has been built up carefully over decades, with its Literature Production Centre producing countless resources for use in the classroom. The prevalence of bilingual education has undoubtedly assisted the Yolngu of Yirrkala and surrounding areas in maintaining a strong cultural identity, with great efforts being made to document and preserve many aspects of traditional culture, as well as pass it along to the next generation. Leaving aside for just a moment the question of whether bilingual education is the best way for students to learn English, it should be defended as a fundamental right of Indigenous peoples who wish to maintain literacy in their traditional languages. Now, as to whether English-only education leads to better outcomes for students… Bruce Wilson feels confident enough to make his recommendations “based on the view that Indigenous children learn English in the way that other children learn English…” (p. 7) However, the evidence does not support this, and it is extraordinary for Wilson to make this sweeping claim without referring to the research. Margaret Clark does a fantastic job of explaining why “English only” doesn’t meet remote Indigenous children’s needs so I won’t replicate what she’s said. I will explain briefly how the bilingual process works in our school and why I think it’s essential. In the bilingual program, students first learn to read and write in a simplified version of their clan languages known as Yolngu Matha (with regular exposure to oral English). This approach reflects the fact that students speak almost no English when they being school; cultural considerations aside, it makes perfect sense to commence their education using a language they understand and use in very context. Students begin formal English literacy instruction in Year 4. Students who have attended school regularly (80 per cent or more, on average) are generally able to make this transition. English instruction in all classes up to Year 10 utilises the Walking Talking Texts program, developed specifically for Indigenous students learning English as an additional language. Last year two separate groups of evaluators praised our school’s dedicated teachers and sophisticated whole-school approach to bilingual education, particularly the ESL/EALD program in the early years, where an experienced bilingual teacher worked closely with an English teacher to engage students and build a strong foundation for learning. Students approached English in a fun and practical way, such as through cooking, without the pressure of trying to learn words they didn’t understand. During last year’s bilingual celebrations, participants reflected on the school’s success in training and mentoring bilingual teachers. One of the evaluator teams was doing a study looking at effective teaching practice in remote Indigenous schools right across northern Australia. They were impressed with our school’s rigorous bilingual program, and by contrast described visiting remote schools as part of their study where Indigenous students, despite being educated in English from day one, were leaving school as young adults unable to string together more than three English words. Their “native” language was Creole. However, even with the bilingual program there is a clear ceiling most students at Yirrkala reach with their English literacy: they generally struggle to get beyond what we call the Level 3 or 4 ESL benchmark, where language moves away from an informal and conversational nature to language of a more abstract, written quality. This means that students can’t access higher-order language and concepts, and locks them out of the basic language required for vocational pathways, let alone the “secret” English language of intellectual knowledge and power. If you have a look at any school curriculum, there is a huge intellectual leap expected of students in Year 8 and 9, and that is clearly a stumbling block for nearly all remote Indigenous students. What is the importance of bilingual education here? One of the interesting findings my former principal related to me was that, although students only begin formal English instruction in reading and writing in Year 4, by Year 6 their first language written literacy already lags their English. This may offer a clue into why their English language proficiency plateaus – they don’t have an understanding of equivalent higher-level concepts in their own language, meaning absorbing those concepts within their conceptual framework is more difficult. Unsurprisingly, as students get into the middle years we typically start to see a drop off in attendance and engagement, as learning content becomes dramatically more challenging just as first language support falls away. This is not the only factor affecting student retention but it is a very important one. One of my biggest difficulties as a middle years teacher is conveying complex concepts to students in what is not only a foreign language, but also an alien cultural framework. For example, I’m currently teaching my students a unit on advertising; it is full of concepts such as “audience” and “consumer” which do not readily correspond to Yolngu experiences and traditions. That doesn’t mean we shouldn’t teach such things. It does mean we need to look at the best way of doing it meaningfully. Rather than more English-only instruction, what’s actually needed is more first language support. We have Yolngu assistant teachers working in all primary classrooms, but the funding for these positions at the secondary level was cut several years ago (one position was reinstated this year to work across the two middle years classes). Unfortunately Bruce Wilson puts this issue in the too-hard basket, concluding that “The lack of trained first-language teachers reduces its likely effectiveness and the level of resourcing required for effectiveness means it is not sustainable.” (p. 61) In other words, it’s expensive and difficult and therefore we won’t commit to it. That’s not nearly good enough, given the priority Wilson attaches to improving Indigenous education outcomes. 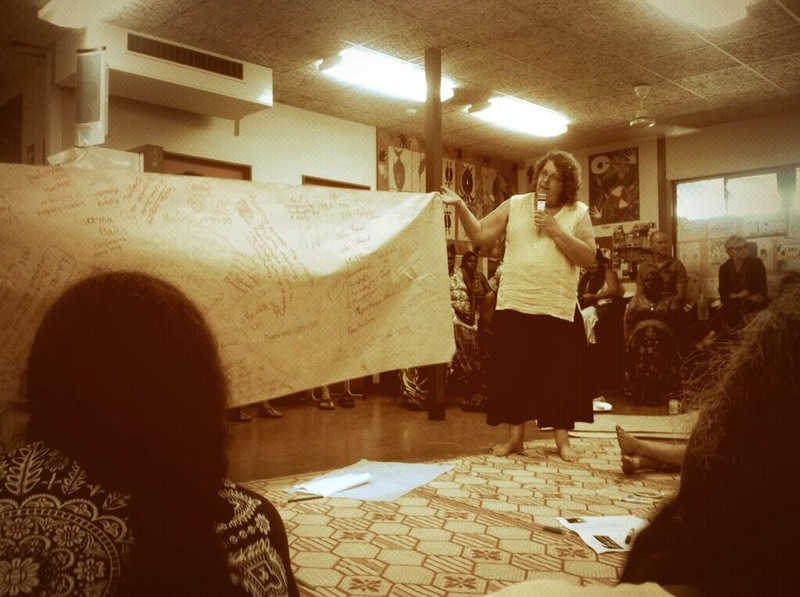 Yirrkala has a strong history of training and mentoring bilingual teachers, often with little institutional support. A renewed emphasis on the importance of bilingual teachers should be a major recommendation of Wilson’s final report. I must confess I was initially a bit sceptical about the bilingual approach; “common sense” would seem to indicate it makes sense for students to learn in English from day one of their schooling. But as I’ve observed the way students in my school learn and the difficulties they face, it has become apparent that maintaining (and strengthening) bilingual education programs is essential to give students the opportunity to succeed at school, as well as maintain knowledge of their own languages and culture. This entry was posted in Uncategorized and tagged Aboriginal, Australia, bilingual, Biliteracy, education, Indigenous, Indigenous Education Remote Australia NorthernTerritory Schools Yolngu Bilingual Biliteracy Yirrkala, NorthernTerritory, remote, schools, Yirrkala, Yolngu by jarvisryan. Bookmark the permalink. Thanks Jarvis. Well-written, and thanks for the links to the other two articles. Has Wilson been up there? Has he seen the way first languages are taught? I am disappointed with the approach this government is taking to Indigenous identity. Language is at the core of identity. You are right to allude to assimilation. I see the difficulties that students from NESB backgrounds have in picking up language when they are illiterate in their own. Keep up the good fight! Hi Jo. Wilson did visit a number of schools – 30-40 I believe – and these are listed in an appendix of his report. However, I do not think he has really engaged with the research on this question. Thank you Jarvis for a very interesting article. I personally think it would be the best possible education using both the clan language and English in schools in remote areas. Boarding schools do remind me of the Stolen Generation experience. I went to school with several Aboriginal girls who were in this situation, and it was terrible for them. Bruce Wilson needs to look again at the research on bilingual education. the best summary available is Grimes C.E. 2009, “Indigenous languages in education: what the research actually shows”, Australian Society for Indigenous languages. This research demonstrates a well designed, well run and resourced bilingual program is more likely to result in better English language outcomes. This has been Yirrkala’s experience over 40 years. The additional point I would like to make is that this is a decision that should be made by Indigenous communities themselves. The need for community engagement is something of a motherhood statement among policy makers, system and school administrators at present, however there is little evidence in recent times in the NT that this means any more than an a predominantly one way communication exchange where we will tell you what we think is best for you. Lets hope The Wilson Review sees some merit and justice in a genuine engagement with Indigenous parents about the shape of education and training in their communities. Hi Jarvis, I’m getting in touch with you because I am writing an article on Bilingual Education for the US-based Rethinking Schools, with a focus on bilingual education in Australian Indigenous communities. It’s a relatively short article (not a thesis! ), but I’m looking to include teachers’, parents’ & particularly students’ voices rather than a more academic approach. I entered my email below, so perhaps if get a chance you could email me?